Clean Living RV Park understands that our residents enjoy being close to home, and many of them enjoy relaxing on the premises, without the hassle of having to go to town. Therefore, we provide many amenities to make life with us more convenient and comfortable. For instance, all of our sites provide the option for a 30 or 50 amp hookup for convenience, and we provide free wi-fi for our residents to utilize inside of their RVs. 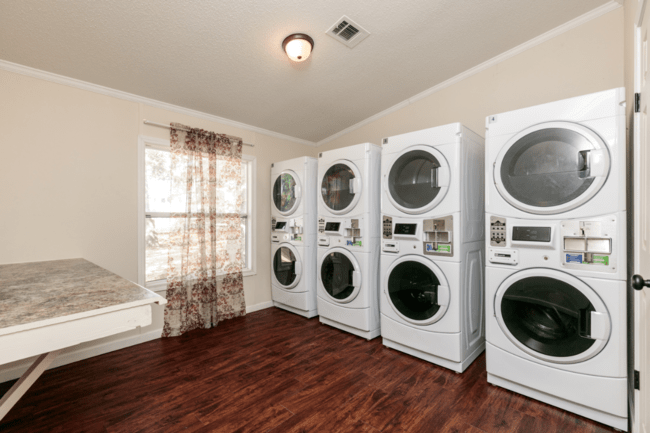 We have a community clubhouse, where our residents can meet and enjoy time together or take advantage of the showers and laundromat. We are a pet friendly RV park with a fenced in dog park where our residents can enjoy the day and outdoors with their four-legged family members. Our on-site storage units, overflow parking spaces and on-site propane station have been popular amenities as well. Our personal favorite is the Texas Room (full kitchen included) where guests can have gathering and cook. Construction is nearly complete on our new work-out room for those that want to get their exercise on.